It may seem like not a lot of salve comes in the container, but remember that there is a lot of actual CBD in there. When keeping that in mind, the price is really pretty low. Just use a little here and there on your skin, and you’ll quickly become a believer. We already have a few of us who have switched over to CBDol CBD salve exclusively, and most everyone will stock it in their medicine cabinet. If you’re looking to buy CBD salve, give this one a go. With a wide array of CBD products that are priced well, we’ve been making our way through all of CBDistillery’s catalog. Next up is their CBDol CBD salve. They describe it as more of a muscle rub, but we’re going to test all that it can do. If you’re looking to buy CBD salve, make sure you read this review first. CBDistillery is perhaps the definition of a quick riser. They’ve only been around since 2016, but have already made a massive impact on the market and become a consumer favorite. Perhaps it’s their activist streak, as the three Coloradans who founded the company are users themselves who are intent on sharing the benefits of CBD. This CBDol CBD salve, like most other topicals, is meant to address different skin ailments that you may have. It is an oil-based solution, as is to be expected from any salve. CBDistillery starts with a combination of non-GMO hemp seed oil, olive oil, and coconut oil, which is then infused with the CBD. The idea is to create a hemp salve for pain relief, skin irritation, and even small wounds. In this case, CBDistillery markets it as more of a muscle rub. In addition to a combination of oil, the CBDol CBD salve contains a slew of ingredients. Some are meant to add scent, while others add to its healing properties. This fast-acting CBD salve contains 500mg of CBD in the small 1oz container. The CBD itself is extracted from mature stalks and stems of pesticide-free hemp plants. The first thing we noticed about this salve is that it has a rather nondescript look to it, at least on the outside. It’s just a little white container, with the word CBDol slapped on the front. It does have some branding for CBDistillery, and of course, the back has more information such as ingredients, but it was really simple. This is sort of par for the course for this brand, and that’s not necessarily a bad thing. They focus on what’s inside the box rather than outside of it, and we can’t fault them for that. Popping open the lid of the CBDol CBD salve you are met with a mixture of smells that overall were quite pleasant. What shone through was the mint, but there were also hints of cinnamon and lavender. The initial smell goes away for the most part after you apply it, so for the one person on our team who wasn’t a fan, they didn’t have to put up with it for very long. Lastly, we do have to admit that it’s kind of an odd brown color. Perhaps because of its organic hemp origins? Not a huge deal, but it was a bit surprising as nobody expected it. As with all topicals, you’re going to be treating a localized area. Whether this is a CBD salve for pain or you’re using it a different way, simply rub some into the afflicted area. There’s 500mg of CBD in just 1oz, so you don’t need to apply a lot. Rub it in and then give yourself about 15 minutes at most to feel the effect. Re-apply when you need to further treat symptoms. It’s different for each person, but as a rule, you’ll likely want to re-apply every 4-5 hours. Everyone on the team was anxious to dig in and see what the CBDol CBD salve could do. It did initially have a soothing feeling of just about everyone’s skin. That might have been the mint and lavender, or other ingredients, but it was a really nice way to start feeling the effect. We also forgot about the odd brown color, as it dissipated into our skin rather easily. There was one person on our team that didn’t like the feel of it compared to another CBD salve she had tried, but it seemed like she was expecting to be more of a CBD cream. It isn’t, it’s definitely thicker and waxier, but at the same time, it wasn’t greasy or anything. Most of us were going to use this as a hemp salve for pain relief, like others we had tried. For that, it worked really well! It promptly took care of the aches and pains in various joints we each had. It also worked great to ease tender muscles, and especially so after a workout or run. If you’re an athlete and looking for a good natural muscle rub, you’ll be thrilled with this salve. It didn’t seem to make as much of an impact on the skin conditions a few people on the team were treating. It did okay with eczema, but the person suffering from psoriasis didn’t report back anything significant. Take that as you will, as each person’s body will react differently. Hemp Seed Oil, Olive Oil, Coconut Oil, Lavender, Peppermint, Wintergreen, Marjoram, Eucalyptus, Arnica, Basil, Camphor, Frankincense, Tea Tree, Green Tea, Lecithin, Cinnamon, Grapefruit Seed, Aloe, USD Kosher Glycerin, Magnesium, CBD, Bees Wax. Offering both live chat and email is a great way to make us fans of their customer support. Responses were rather prompt most of the time, although there was one exception on a live chat that we just waited and waited. Overall, really good support and friendly reps too! 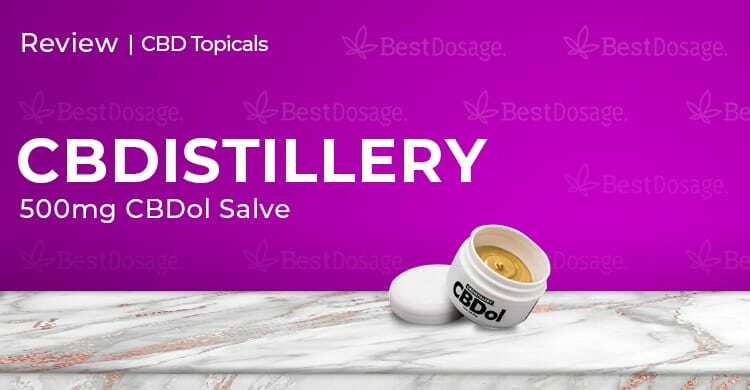 The CBDol CBD salve is yet another in a string of high-quality products at a good price from popular vendor CBDistillery. This higher mg salve really does the job and drew high praise all around. It had a really nice smell and most of the people on the team really liked how it felt on their skin. We think it’s right that CBDistillery calls it more of a muscle rub, even though for all intents and purposes it is also a CBD salve for pain. Where it was enjoyed the most was after working out muscles and looking for relief afterward. It did work great on joint pain and arthritis, which is something that both young and old deal with. It was a tad more hit and miss with chronic skin ailments, but still worth trying to see if it works for yours.